HOMER uses the Kinetic Battery Model (Manwell and McGowan, 1993) to determine the amount of energy that can be absorbed by or withdrawn from the storage bank each time step. The Kinetic Battery model is a two-tank model with kinetics that match lead acid battery behavior. The first tank contains "available energy," or energy that is readily available for conversion to DC electricity. The second tank contains "bound energy," or energy that is chemically bound and therefore not immediately available for withdrawal. The following diagram illustrates the concept. Three parameters are used to describe this two tank system. The maximum (or theoretical) storage capacity (Qmax) is the total amount of energy the two tanks can contain. The capacity ratio (c) is the ratio of the size of the available energy tank to the combined size of both tanks. The rate constant (k) relates to the conductance between the two tanks, and is therefore a measure of how quickly the storage can convert bound energy to available energy or vice versa. HOMER determines these three parameters from the storage's capacity curve, which you specify in the Storage library. 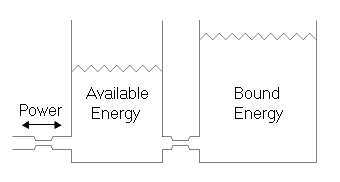 where Q1 is the available energy and Q2 is the bound energy.